You may have heard that snakes unhinge their jaws to swallow their large prey, but this isn't true. They do, however, have the ability to open their jaws very wide, sometimes wider than seemingly possible, due to an extra bone, stretching skin and separate lower jaws. All of these traits allow a slender-bodied snake to swallow a large rat, rabbit or larger animal victim. Most people are aware that snakes swallow their food whole as opposed to taking bites, but how they do this is still a mystery to some. Snakes have specialized jaws that enable them to eat their large prey, along with specialized skin and bones that can move in different ways. Their method of eating allows them to eat large meals at one time, sometimes sustaining their need to feed for several weeks. The joint between your jaw and your skull is one of the pivotal features that allows you to open your mouth. Located just below the ear on either side, you can easily feel this joint when you open and close your mouth. Snakes have an additional bone between the jaw and skull, which allows them to open their mouths much wider than a human can. One of the most fascinating facts about a snake's eating method is his separated lower jaw. Instead of being attached with bone or being one piece, the two sides of the jaw are attached only with stretchy ligaments. The right and left sides of the jaw do not meet in the middle, allowing each side to move independently of the other. When eating a meal, particularly one that is much larger than himself, the snake will "walk" the right and left lower jaw, one after the other, up the body of his prey. This, along with his backward-curved teeth, effectively moves the prey animal further into the snake's body. Once the prey animal has begun to pass through the mouth and into the esophagus, the snake's body needs to be able to pass such a large meal. 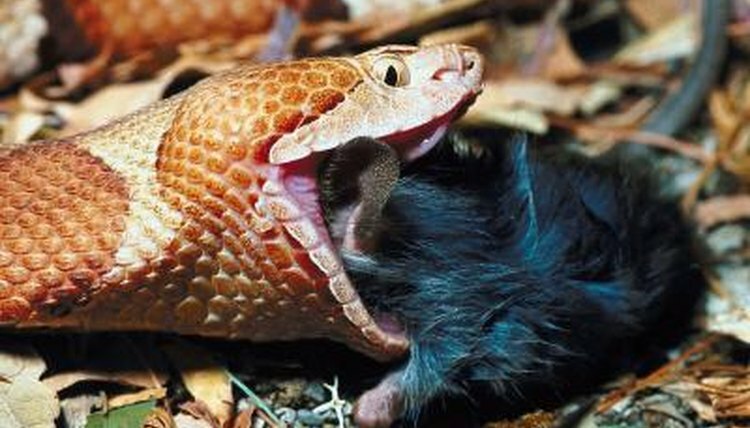 Humans and many other animals must chew their food into smaller, bite-sized pieces to be able to swallow, but a snake's body and skin stretch to encompass the full size of the prey. The muscles in the snake's esophagus contract to push the food down the esophagus toward the stomach. The snake then moves his spine behind the food, which causes his ribs to push in on the food, effectively pushing the food further down his throat into his stomach.